BACKGROUND AND PURPOSE: Intraprocedural transcranial Doppler sonography has identified multiple microembolic events during and immediately after carotid endarterectomy (CEA) or angioplasty, yet the rate of clinically evident stroke is small. To determine the significance of the transcranial Doppler sonography findings, we examined patients by use of diffusion-weighted imaging and fluid-attenuated inversion recovery MR imaging before and immediately after CEA for evidence of clinically silent ischemic events. METHODS: Twenty-five patients with atherosclerotic disease of the carotid arteries underwent diffusion-weighted imaging and fluid-attenuated inversion recovery MR imaging performed, on average, 3 days before and 12 hours after CEA. Diffusion-weighted images were acquired in three orthogonal directions at b = 900. Pre- and postoperative neurologic examinations were performed by the same physician. RESULTS: After endarterectomy, 4.0% of the patients (one of 25 patients) showed a single, cortical focus of restricted diffusion and new fluid-attenuated inversion recovery hyperintensity, measuring <1 cm in diameter, ipsilateral to the CEA. The postoperative neurologic examination showed no change in status from the preoperative baseline state. This patient had an intraoperative course complicated by the development of a large luminal thrombus, necessitating thrombectomy. CONCLUSION: The use of diffusion-weighted imaging may serve to improve conspicuity of clinically silent infarcts after CEA. An important next step is to determine the risk factors that predispose to detectable parenchymal ischemic events. Carotid endarterectomy (CEA) is a procedure intended to reduce the risk of cerebral ischemia by removal of atherosclerotic plaque from the common carotid artery bifurcation. CEA is efficacious for symptomatic carotid stenosis >69% and possibly for asymptomatic stenosis >60% (1, 2) Seemingly contrary to its intended goal, surgical manipulation of atherosclerotic plaque may result in cerebral hemodynamic compromise. The overall risk of perioperative stroke and death at 30 days is estimated to be 6.5%, with significant disability or death occurring in 2.0% of cases (3). Transcranial Doppler sonographic studies of patients during CEA indicate that microembolism is relatively common and is highly correlated with peri- and postoperative symptomatic cerebral ischemia (4). The concurrent appearance of clinically silent signal abnormalities on T2-weighted images has been noted by several authors (5, 6). The low proportion of T2 signal abnormalities relative to the number of microembolic events suggested by transcranial Doppler sonography raises the possibility that additional ischemic foci are present but are not identified when using conventional MR imaging techniques. In this study, we examined patients by use of diffusion-weighted imaging before and immediately after CEA for evidence of clinically silent ischemic events. The increased sensitivity of diffusion-weighted imaging over other MR imaging sequences suggests that this technique may produce an improved estimate of cerebral ischemia associated with interventional procedures. Twenty-five patients with atherosclerotic disease of the carotid arteries, who were recruited at the San Francisco Veterans Administration Medical Center for the multicenter Accuracy of Carotid Stenosis by Correlation with Endarterectomy Plaque Trial, were studied for a 12-month period. All patients were male, with an average age of 71 years. All patients underwent imaging in accordance with the Committee for Human Research at the University of California, San Francisco. Imaging studies were performed on a 1.5-T clinical unit. Axial fluid-attenuated inversion recovery imaging parameters were as follows: 8000/110/220/2 (TR/TE/TI/excitations); section thickness, 5 mm; matrix, 256 × 256; and field of view, 230 mm2. Spin-echo diffusion-weighted imaging parameters were as follows: 6000/135/1; b = 900; section thickness, 5 mm; matrix, 256 × 256; and field of view, 260 mm2. Diffusion-weighted images were acquired with diffusion sensitization gradients applied in three orthogonal directions. All patients underwent digital subtraction angiography of the carotid arteries before undergoing surgery. All pre- and postoperative MR imaging studies were read by neuroradiologists blinded to neurologic status and clinical outcome. The standard operative procedure for CEA is described. The procedure is performed with the patient under local anesthesia and conscious sedation. An incision is made along the anterior margin of the sternocleidomastoid. The common carotid bifurcation is then exposed, allowing for hemostasis above and below the arteriotomy site. Cross clamps are applied to the common, internal, and external carotid arteries, proximal and distal to the plaque. If hemostasis results in loss of consciousness and/or <40 mm Hg internal carotid artery back pressure, bypass shunts are used. Transmural arteriotomy is then made proximal to the plaque, with extension to the internal carotid artery in adventitia only (plaque in intima and media). A Holly dural elevator is commonly used to dissect the plaque from the overlying adventitia. The plaque is then removed en bloc by incision of common carotid artery intima and media and eversion endarterectomy of the external carotid artery. A Dacron patch (4–5 mm wide) is usually placed along the longitudinal incision. After closure, intraoperative sonography confirms luminal patency. Complete pre- and postoperative neurologic examinations were performed by a single neurologist (L.B.) in all cases. After endarterectomy, 4.0% of the patients (one of 25 patients) showed a new single cortical focus of fluid-attenuated inversion recovery hyperintensity, measuring <1 cm in diameter, ipsilateral to the CEA (Fig 1). Associated diffusion-weighted imaging hyperintensity was observed, suggesting acute ischemia. Unfortunately, the preoperative diffusion-weighted imaging coverage did not include the region of interest, raising the possibility of acute ischemia developing before surgery. This patient was unique in that he could not tolerate having his internal carotid artery cross clamped, necessitating shunt bypass. Furthermore, this patient experienced the only complication of the study, developing hemodynamically significant thrombus along the suture line. Images show interval appearance of signal hyperintensity in the left middle frontal gyrus. A, Axial fluid-attenuated inversion recovery image obtained 15 days before surgery. B, Axial fluid-attenuated inversion recovery image obtained 1 day after left carotid endarterectomy. C, This finding is hyperintense on the diffusion-weighted image, consistent with acute ischemia. Note the lack of bright diffusion signal in the chronic perirolandic infarct. A 54-year-old right-handed man with a history of left middle cerebral artery territory segmental infarct, with near complete recovery of function, presented for CEA after 6 months of recurrent left transient ischemic attack symptoms. Doppler sonography revealed a mild increase in flow velocity in the proximal left internal carotid artery (bulb, 92 cm/s peak systolic velocity/20 cm/s end diastolic velocity; proximal internal carotid artery, 134 cm/s peak systolic velocity/34 cm/s end diastolic velocity; mid internal carotid artery, 150 cm/s peak systolic velocity/50 cm/s end diastolic velocity). 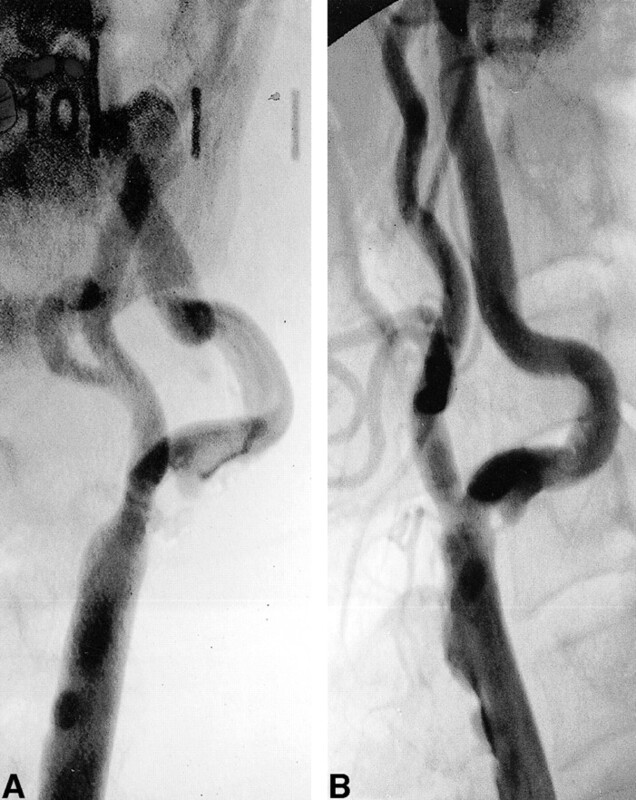 Digital subtraction angiography showed a calcified, ulcerated plaque at the carotid bifurcation with a 1.5-cm distal extension. Maximal stenosis was 40% by North American Symptomatic Carotid Endarterectomy Trial criteria (Fig 2) (1). The left internal carotid artery was angled 70 degrees relative to the external carotid artery. This was the largest bifurcation angle in our series (by 20 degrees). Because of the patient's symptoms, CEA was performed. The patient did not tolerate placement of carotid cross clamps, necessitating use of a bypass shunt. The redundant loop of the proximal internal carotid artery was resected. At the time of completion of an end-to-end anastomosis, intraoperative sonography was performed to assess luminal patency. An abnormally high flow velocity was observed. Arteriotomy revealed a platelet aggregate on the distal suture line. After reopening the artery and removing this defect, intraoperative sonography showed normalized flow velocities and no luminal defect. The operative and postoperative courses were uncomplicated. A postoperative neurologic examination showed no new deficits. We have shown a 4.0% incidence of positive diffusion findings after CEA. Our reported incidence is significantly lower than the 33% rate of silent infarction that was recently published by Müller et al (7) but is consistent with North American Symptomatic Carotid Endarterectomy Trial surgical complication rates and the results of previously published studies using T2-weighted MR imaging as an outcome variable (3–6). Furthermore, our results are consistent with the data presented by Forbes et al (8), who reported a 0% incidence of postoperative diffusion abnormalities in 14 study participants, and, more recently, by Barth et al (9), who showed a 4.2% incidence in 48 patients. Embolic particles averaging <200 μm in diameter rarely produce observable infarcts at the time of embolization. It is likely that they occlude vessels at the arteriolar (50–100 μm) and capillary (5 μm) size range. Ample collateral vasculature exists at this level, although microscopic ischemia undoubtedly occurs, with measurable neurocognitive deficits (10, 11). Ischemia from particles <200 μm in diameter may occur after 3 days, possibly because of an inflammatory reaction induced by the plaque emboli lodged within larger vessels and resultant thrombosis. Particles between 200 and 500 μm may occlude pial perforator vessels, resulting in terminal vascular zone ischemia. Experimentally produced infarcts with atherosclerotic particles in this size range produce lesions that appear within 1 day. These lesions are usually small and subcortical in location (12). These observations may explain the discrepancy between our results and those presented by Müller et al (7), who report an average period of 2 to 3 days between CEA and postoperative diffusion-weighted imaging. Delayed postoperative imaging may increase sensitivity to ischemic changes induced by particles that are <200 μm. Microembolism may occur at any point during CEA, either because of plaque fragmentation or thrombus formation. It is likely that manipulation of plaque during angiography, percutaneous transluminal angioplasty, or endarterectomy increases the relative numbers of large embolic particles. The need to reopen the carotid artery, as in our case 1, has been shown to correlate with increased risk of perioperative stroke (8). Several authors have reported an association between >10 transcranial Doppler events measured during CEA and the risk of silent or clinically significant ischemia associated with the procedure. Coggia et al (13) evaluated the risk of embolism at various stages of carotid angioplasty in ex vivo plaque specimens. They report that the maximum particle size increased from 220 μm during wire/catheter passage to 1100 μm after angioplasty. Using a similar experimental design, Rapp et al (12) showed a progressive increase in particle numbers in 20 successive angioplasty procedures, from a mean of 24 with wire passage to a mean of 172 with angioplasty plus stent placement. It is possible that in case 1, the positive diffusion findings were secondary to spontaneous embolic events immediately preceding surgical intervention. The average time of preoperative imaging for all our patients relative to surgery was 3 days. The probability of infarction occurring during that time is dependent on a variety of factors, including plaque morphology, presence of anticoagulants, and state of hydration. The presence of spontaneous embolic events is a significant, independent predictor of subsequent, clinically significant, ischemic events (14, 15). Interestingly, rates of ≤70 embolic events per 30 minutes have been observed in patients with known internal carotid atherosclerotic plaques, whereas only 10 or more transcranial Doppler events during CEA are highly associated with postoperative ischemic findings (4, 16). This again supports the notion that embolic particles induced by surgery are larger, on average, than particles spontaneously embolizing from plaque. We have observed a 4.0% incidence of lesions with restricted diffusion, ipsilateral to the site of CEA, within 24 hours of surgery. These results are similar to those of previous studies using T2-weighted imaging, suggesting that diffusion-weighted imaging does not reveal additional clinically silent emboli within the first 24 hours. Postoperative diffusion-weighted imaging performed after 72 hours may uncover additional foci of restricted diffusion that develop from emboli that are <200 μm or from embolic events occurring during the postoperative period. ↵1 This work was supported in part by NIH (grant HL56307). ↵2 This work was presented at the 38th Annual Meeting of the American Society of Neuroradiology, Atlanta, April 2000. ↵3 Address reprint requests to Robert J. Feiwell, Neuroradiology Section, University of California, San Francisco, 505 Parnassus Avenue, Room L371, San Francisco, CA 94143. Diffusion-weighted MR imaging in carotid angioplasty and stenting with protection by the reversed carotid arterial flow.